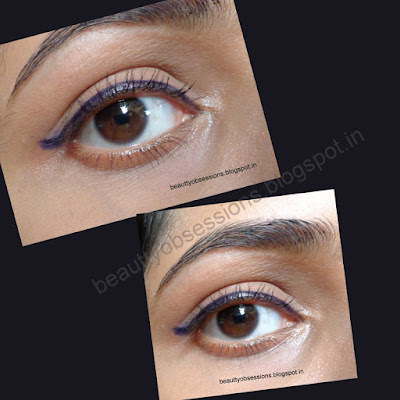 Flaunt The Blue Cat Eyes With Oriflame The ONE Eyeliner Stylo 'BLUE' .. I think I am the last one who is reviewing this ,but taking an attempt is better that never..right.. Anyway let's get into the review. As everyone knows that Oriflame had launched some exciting makeup stuffs in the starting of this year and most of the products of that range is of superb quality and well priced.. The brand was very kind enough to send me couple of stuffs from that range (the ONE range) and I have already reviewed some of them here and today is the time to review this really pretty blue liner from Oriflame itself. Price: Rs499/- for 0.8 ml. Ingredients & Shelf life are not mentioned. It is a pen style eyeliner like the Maybelline Colossal Eyeliner which is very easy to apply .Whether you are a beginner or a pro,you are going to enjoy while applying it . It is best for drawing a perfect winged liner. Due to its size it is very easy to handle like you carry your pen. The felt tip of this liner is very soft and smooth yet flexible which makes the process quite easy.There are two shades available,Black and Blue . There isn't any further informations on the packaging which I consider as a drawback. The shade I have is a blue shade which is not that bright shade of blue but a dark midnight blue shade which seems equal to black colour on eyes. The formula is very light-weight and it dries up really quickly like in some seconds. I love this part of it. It is very easy to draw with it ,just press a little and draw a line as per your preference. Incase you want a thick line then press a little more while applying. I need one stroke or sometime two strokes only to get a perfect line as the colour is quite dense. This liner dries to a semi-matte finish look with a little glossy-ness which again I love as it looks more natural in this way. I appreciate its staying capacity. once I applied this in the morning and i found the same finish and same effect even after 8-9 hours in the evening. isn't it great ?? But the main issue is it isn't water-proof hence you can't wear it while outing during rainy time or during hot summer season/if you have very oily eyelids . But I love it and do apply most of the times..
P.S- PR sample ,but my review is honest and unbiased. Have you tried the Oriflame ONE eyeliner Stylo ? What is your experience ?